Not exactly Nighthawks, but if you ever wondered where the term "sliders" comes from -- it comes from White Castles, the mini-burger franchise found in a few Midwestern cities. The one above is at the corner of Reading Road and Taft Avenue in Cincinnati. The term sliders? As in "slide right in, slide right out." In other words, a veiled reference to poop. Which is an interesting way to sell your burger. But hot damn these things are tasty, especially when hot off the fryer. Not a great photo -- I underexposed and the parking lot had dried a little much from an earlier rain. 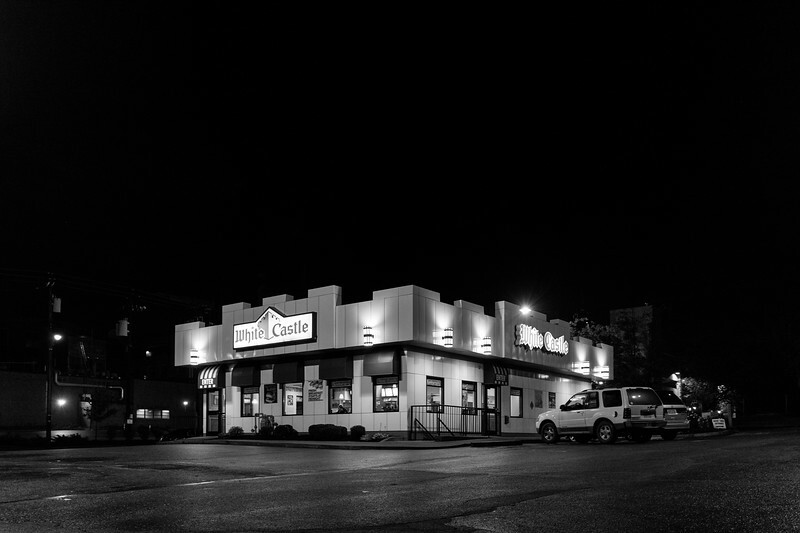 I took the photo at night because most people visit White Castles at night after they've had too much of something. Also, the new stores aren't as interesting architecturally as the old buildings of my youth that were much more castle-like. All my photo galleries are here -- with info on buying prints and licensing. Thanks for checking it out!